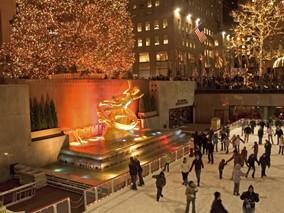 New York City is fun and exciting to visit any time of the year, but New York for the holidays is magical. The city adorns itself with millions of lights; the department stores unveil their animated windows; and Christmas traditions such as the spectacular at Radio City Music Hall are as thrilling today as they were 50 years ago. Rockefeller Center in the heart of New York City's midtown is an Art Deco icon. It's also home to NBC Studios, AOL Time-Warner, General Electric, and other corporate giants. During the holidays, however, the multi-building center takes on a more festive air. The Giant Christmas tree, a symbol of the holiday in New York, goes up right after Thanksgiving and is a must-see for anyone in New York for the holidays. The plaza is also home to a large ice-skating rink in the winter, where skaters of all skill levels -- and ages -- glide along in the shadow of the statue of Prometheus. No trip to New York for the holidays would be complete without attending one of the many stage productions offered in the city. Perennial favorites include the holiday spectacular at Radio City Music Hall, the festive song and dance revue featuring the world-famous Rockettes and a cameo by Santa Claus. Also popular is the New York Ballet's annual production of George Balanchine's "The Nutcracker," the charming Christmas ballet set to the music of Tchaikovsky. Other favorites include Dickens' "A Christmas Carol." New York City is known for its elaborate holiday decorations. Among them are the origami holiday tree at the American Museum of Natural History, a traditional tree adorned with delicate Japanese folded paper animals and shapes. Another must-see is the Baroque tree at the Metropolitan Museum of Art, which is trimmed with gilded Renaissance-style angels with a hand-painted creche at its base. Central Park, in the heart of Manhattan is strewn with thousands and thousands of twinkling lights. Shopping in Manhattan in legendary, and for the holidays, the city shows its best merchandise and decor. The major department store -- Macy's, Bloomingdale's, Bergdorf Goodman's -- gather a kind of festive air with shoppers, carols, decorations, and merchandise competing for visitors' attention. Animated store windows, unfortunately long gone in most parts of the country, are live and well in New York. Department stores spend all year planning their themes and designs and the unveiling of the year's display is always a popular event. Whether you have kids or not, you're sure to be impressed with the dancing elves, fairies, and snowflakes, and of course, Santa. If you're planning to visit New York for the holidays, plan ahead. Many of the most convenient and most popular hotels are booked six months or more in advance. To be near the holiday decor and shopping, stay near Central Park, Fifth Avenue, and 57th Street. Don't even think about renting a car in Manhattan, especially at holiday time. Traffic is congested and notoriously hard to navigate. Taxis are generally easy to fine and the subway is convenient for daytime travel. Tickets for popular shows also require advance planning. Online sources, such as Ticketmaster, make it easy to buy tickets before you arrive in the city.